This article analyses the most significant trends in nutrition over the last hundred years. artificial flavourings and sweeteners to mask the lack of taste due to the depletion of the nutrients. We look at how these things have influenced our food system how they align with the the obesity epidemic. Finally, we’ll examine what you can do to address the effects of these trends to optimise your nutrition and health. Long-term data shows that there has been a significant shifts in our micronutrient and macronutrient intake due to changes in farming techniques, government grants, innovation in flavour technologies and the widespread use of artificial sweeteners. Food has become more plentiful and tastier. However, the food we have now contains less micronutrients (e.g. Vitamin A and minerals such as phosphorus, calcium, potassium, sodium and magnesium). Rather than a Protein Leverage Hypothesis, it appears that there is also a Nutrient Leverage effect could be at least a partial explanation for the significant increase in energy intake that we have seen over the past four decades. With a decline in nutrient density, our appetite ramps up and we consume more food to get the nutrients we need. The macro and micronutrient data used in this analysis is taken from the USDA Economic Research Service while the obesity data (shown below) is taken from the Centres for Disease Control and Prevention. We’ll start the story by looking at how food production and obesity have changed over the last century or so. The period between the American Civil War and the start of the 20th Century was a time of rapid technological innovation and industrialisation. This included the use of more more machinery, pesticides, fertilisers and feed additives to feed the growing population. The focus of nutrition during this time was feeding armies and optimising food production with limited resources. After some lean years through The Great Depression and World War II, America became the wealthiest country in the world. The US population was a bit like a starving man who stumbles into an all you can eat buffet! You’ve likely heard parts of this story before, so I’ll keep it keep it brief. In the 50s, autopsies on troops found signs of plaque buildup in their arteries that was assumed to be due to high cholesterol in the diet. We now understand that dietary cholesterol doesn’t necessarily equate to cholesterol in the blood or plaque in the arteries, but at the time, cholesterol and saturated fat were obvious targets and priorities for reduction. Although heart disease rates had been on the rise for a while, it became public enemy number one after President Eisenhower had a heart attack in office in 1955. Ancel Keys’ high profile Seven Countries Study began in 1956, pointing the finger at dietary fat as the primary culprit for heart disease. less high-fat meat, egg and dairy products. Americans have cut their cholesterol intake to record lows. But, unfortunately obesity rates have headed continued on in the other direction. Toward the end of the Vietnam War, food prices were soaring due to high inflation! With an election imminent, President Nixon appointed Earl Butz as Secretary of Agriculture. Butz, in an effort to drive down food prices, pushed farmers to, rather than rotating their crops and letting their fields rest, plant up their entire farm “from hedgerow to hedgerow” and “get big or get out”. Farmers ramped up their use of fertilisers around 1930 to produce more food with less area in less time. While fast-growing plants and animals contained plenty of energy, neither the plants or the animals had the same flavour. So the processed food industry teamed up with chemical engineers to address this problem. “That all changed in the mid-1950s when the first gas chromatograph went on sale. Before that, scientists had absolutely no idea where flavour came from. They knew a lot at this point about things like the macronutrients, protein, carbs and fat. But flavor was a mystery because flavours exist in such minute amounts. “With the gas chromatograph, you could take a piece of food and literally turn it into a gas. You volatize it and send the gas through this big coil. The coil separates every compound out. “Out the other end comes a flavour chemical, and then they would analyze it. It didn’t take long for them to analyze the flavours in things like fried chicken, tacos, tomatoes or cherries. Then they started making flavours in flavour factories. In the late 60s, food scientists created High Fructose Corn Syrup from the excess supplies of subsidised corn. HFCS displaced cane and beet sugar until 1999 when soft drinks started to fall out of favour. Robert Atkins published his New Diet Revolution in 1992 which made many more cautious of carbohydrates and less fearful of fat. In response, the food industry did what any smart for-profit organisation would do. It pivoted to give the public what they wanted: more taste with less sugar. In 1999 Splenda (or sucralose) was approved by the FDA and exploded onto the market, replacing HFCS in soft drinks and other foods. While there are conflicting opinions on whether or not artificial sweeteners cause weight gain, foods that taste amazing due to chemical sweeteners and flavours optimised for bliss point are easier to overeat. While the low carb movement won the battle against sugar back in 1999, we are all still losing the war against obesity. Today’s foods are still check full of plenty of energy and flavour thanks to the advances in modern agriculture, modern flavour technology and artificial sweeteners. The chart below shows that, over the past century carbohydrate availability has dropped, come back up and then dropped back a little with the introduction of artificial sweeteners displacing sugar. In spite of the reduction in carbohydrates two decades ago, the obesity has powered on. So what is continuing to make us fatter? Why are we eating more than ever before? The first obvious place to look is macronutrients (i.e. carbs, fat and protein). fat has enjoyed a steady upward trend over time. 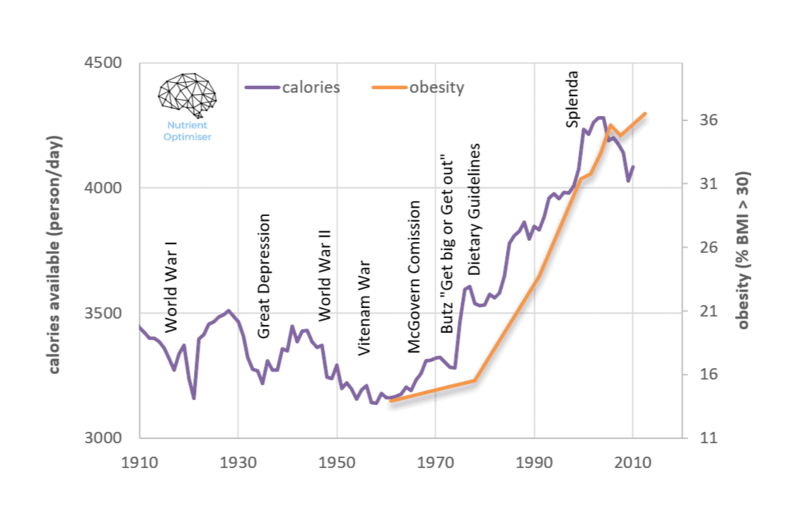 While carbs have moved up and down, obesity rates have tracked fairly closely with total energy availability. Saturated fat production has risen slightly. However, the supply of the “good fats” have increased much more, particularly polyunsaturated fats (from soy and corn). If you were cynical you might think that the demonisation of saturated fat and promotion of unsaturated oils was part of the processed food industry’s ploy to get you to eat more of their foods. While we don’t have data for omega-3 intake, it’s likely that our omega-6 to omega-3 ratio has deteriorated substantially with more polyunsaturated fats and less fish intake. A low omega 3:omega 6 ratio leads to the pathogenesis of many diseases including cardiovascular, cancer and inflammatory and autoimmune diseases. Fat-soluble vitamin A is critical for normal vision, reproduction and immune function and is found in liver, fish, eggs and dairy. The USDA nutrient availability data shows that it has decreased significantly since the release of the Dietary Guidelines for Americans in 1977. It just so happens that the foods that contain vitamin A also contain saturated fat. These foods were not part of the USDA’s farm-centric agenda or their focus on more “heart healthy whole grains”. Today you’ll need to eat around 2650 calories of typically available foods per day to get the recommended daily intake of Vitamin A compared to 1550 calories per day in the mid-70s when there was more of it in the diet. Vitamin E, which is naturally found in wheat and other plant-based foods, has trended strongly in line with the growth in vegetable oils in the diet. While the Daily recommended intake for Vitamin E is 10 mg/day, it’s worth noting that this is based on median intake levels rather than deficiency studies. The primary role of Vitamin E is to prevent PUFAs from oxidising, so it would be logical that we would need a lot less if we were consuming less polyunsaturated fats from soy and corn. In spite of the decrease in our intake of red meat, we are also getting much more iron in our diet. The current recommended intakes of iron for men are at 8 mg/day and 18 mg/day for women. While men can have excess iron, low iron levels are often an issue for women. Iron deficiencies could be exacerbated by the fact that, while heme iron in meat is more bioavailable, plant-based sources of iron (such as wheat) also contain phytates which bind to the iron and carry it through the digestive tract without being absorbed. Phosphorous (which is found in protein-rich foods such as meats, poultry, fish, nuts, beans and dairy products) has decreased since the mid-40s. Plant-based sources are also less bioavailable than animal-based sources. You’ll need to eat more today than before to get the recommended daily intake of 1000 mg of phosphorus per day. Vitamin B12, which is critical for neurological function, has decreased substantially since the 70s. Calcium decreased in the soils since around the time the widespread use of fossil fuel based fertilisers kicked in. Dairy products and green leafy veggies which contain calcium have also decreased as a percentage of our food intake. You now need to consume 5500 calories per day to reach your 1.3g daily recommended intake of calcium for your bones and heart function. Unfortunately, calcium supplements aren’t effective; you need to get your calcium from food. Potassium has been in decline since the widespread use of chemical fertiliser (typically made from liquid natural gas). You would need to eat around 5000 calories to get your recommended intake of potassium. Potassium supplements are also typically limited to 99 mg, so the average American would need to consume 29 potassium supplement tablets per day to achieve the recommended daily intake! Sodium has been vilified in the past, but it now turns out that hypertension has more to do with too little potassium rather than too much sodium. Sodium is an essential nutrient and we need some to survive. The sodium-potassium pump is central to our energy production and hence having enough of each is critical if we want to thrive. The obesity epidemic actually correlates most closely with the reduction in sodium in our food system! It’s hard to overstate the importance of magnesium which works together with the other minerals in our energy production. Magnesium also seems to have declined since around the time we started relying more on fertilisers to grow food quickly. You now need to consume more than 4000 calories per day to get your daily dose of magnesium. Although correlation doesn’t equal causation, I’ve tabulated the correlation coefficient with obesity. The decrease in nutrients towards the top of this table have the greatest correlation with the growth in obesity. Meanwhile, the table below shows the things that have increased in our food system in parallel with the growing obesity epidemic. How much do you need to eat to get enough nutrients? The table below shows the maximum and current levels of the essential nutrients that have changed significantly, along with the amount of increased intake you would need in order to achieve the recommended intake for these nutrients. Without giving attention to the nutrient density of the food you eat you will need to consume a lot of extra energy to get these key nutrients. For example, you would need to consume an extra 30% energy to get your required vitamin A, 170% extra to get your calcium, 160% extra to get your potassium and 120% extra to get your magnesium. Long-term data shows that there has been a significant shift in our nutrient intake due to changes in farming techniques, government grants, flavour technologies and sweeteners. Food has become more plentiful and tastier, however, they now contain less, micronutrients, particularly Vitamin A and the electrolytes calcium, potassium, sodium and magnesium. Rather than a Protein Leverage Hypothesis, a Nutrient Leverage Hypothesis is at least a partial contributor to the significant increase in energy intake that we have seen over the past four decades. With a decline in nutrient density, our appetite ramps up and we consume more food than we otherwise would in order to get the nutrients we need. If you’re interested in seeing what foods and meals Nutrient Optimiser you need to dial in your micronutrients we’d love you to check out the Nutrient Optimiser Free report. There is another significant source of easily absorbed iron. All flour in the US is fortified with iron. Everyone gets extra iron with every food and snack item. Iron is stored as ferritin in liver, bone marrow, and shows up as serum ferritin in the blood. Ferritin in the US is very much higher than in most other countries. This is so very fascinating, and necessary. Thank you for doing the work!